Battistella are a highly regarded Italian furniture manufacturer specialising in bedroom furniture for children, teenagers and the young at heart! 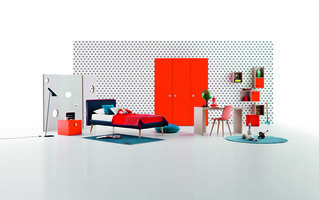 With the Battistella Nidi range of children's bedroom furniture the imagination knows no bounds from its variety of handle shapes to myriad of colours and finishes and with so many versatile designs and options you have the freedom to personalise the furniture for you. The range includes colourful, quirky bedside tables, cabinets, chests of drawers, wardrobes, beds, bunk beds, bedroom mirrors, geometric bookcases, kid's desks and seats all possible in an array of matching colours. Founded over 60 years ago near Treviso in Italy, Battistella's philosophies revolve around design, quality, technology and service and combined with innovation and customer care this has ensured they have become a leading and well respected European furniture manufacturer of bespoke children's furniture. We are constantly adding new Battistella products to the website so if you don't see the item or choice you wish please contact us for details and prices. Robinsons Beds are official suppliers of all Battistella products. 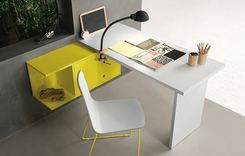 We supply and deliver Battistella furniture throughout the UK including to London, Edinburgh, Manchester, Birmingham, Liverpool, Newcastle, Cardiff, Glasgow, Aberdeen, Kent, Surrey, East & West Sussex, Suffolk, Hertfordshire, Bedford, Buckinghamshire, Berkshire, Oxfordshire, Cambridgeshire, County Durham, Lincolnshire, Wiltshire, Hampshire, Somerset, Dorset, Devon & Cornwall, Gloucestershire, Cheshire, Shropshire, the Midlands, Norfolk & East Anglia, the North West of England, Strathclyde, Lanarkshire, Perthshire, Argyll & Bute and the Highlands of Scotland. We can also ship to mainland Europe.